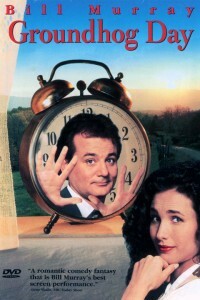 Friend, have you ever seen Groundhog Day with Bill Murray? It’s a great film. Not only because it’s funny, but also, it has an amazing message. Just in case you have been living under a rock and have not seen it, I’ll be careful not to spoil it for you too much! It’s about a man who gets caught in a time loop that he can’t get out of. He keeps repeating the same day, over and over – same people, same circumstances, and more importantly, he does the same thing every day getting him the same results. Nothing changes and it drives him nuts. Have you ever felt stuck in an endless loop like that, where you feel hopeless and think nothing will ever change for you? Well, that’s what happened to the character in the film. However, after experiencing his feelings of frustration and disbelief about his situation, he decided to take some action and make the best of his very disturbing situation. He began to think new thoughts and try new things out. AND everything changed. So, today when I woke up, brushed my teeth, said good morning to the pooch and proceeded to do the walk I do every day, it dawned on me that I too am in a repeating loop. And you are too! AND there are choices you can make, just like the character in the film, to create a different outcome in your life. Now some things like the teeth brushing or dog walking must stay on the “to do” list, but what about the rest of your life? Are there some things not working for you? Your health? Your biz? Your love life? If you want to lose weight, you certainly need to do something differently today or you will certainly get the same results that you got yesterday. Sort of a no brainer! If you feel depressed, irritable or stuck, you need to look at your thoughts and tweak them. By thinking the same thoughts, you will create the same internal environment and feel the same feelings that you felt previously. Bottom line… if you do the same thing, each day, over and over, you will get the same results period! If you think the same thoughts over and over, day after day, the same feelings will be there as well – for sure. In order to change your circumstances, you must become aware of what’s really going on. How much of your pain are you creating? What do you have control over and what can you shift right now? Are you focusing on what you don’t have in your life, or are you enjoying what you do have, and are grateful? Where your thoughts go, your energy flows. What you think you become. I invite you to track your thoughts. Are you stuck in patterns of old thinking and re-creating the day you just had? Did you know that you can catch yourself with an old “untrue” belief about yourself that keeps you limited, and then create a new empowering belief? It can happen and your life will completely transform. If you want to know more about how this transformation can take placeand you are ready to get off the never-ending loop of self-sabotage, and feelings of stuckness, then click here to grab a discovery session with me. It’s a 60 Minute complimentary session for you if you are truly ready to make some change in your life happen. I have a few spots open in my one-on-one coaching program and I have a woman’s virtual coaching group forming right now. If you are ready for a shift and want 2016 not to be just like 2015, let’s chat. ← Brace Yourself… You may be shocked!